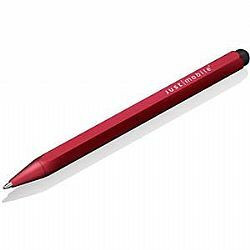 Just Mobile AluPen Pro™ redefines the pen for the 21st Century, combining an iconic iPad stylus with a refillable ballpoint. Sculpted from aluminum, the perfectly weighted AluPen Pro features a high-quality, retractable ballpoint pen at one end, and a soft rubber nib at the other. So you can seamlessly switch between jotting notes on paper and sketching ideas on a tablet. And because the AluPen Pro’s stylus is more precise than your finger, it’s perfect for typing, gaming and web browsing, too. 2007 the iPhone arrived and Just Mobile fell head-over-heels in love. They put all their old projects aside, and began work on creating the most beautiful possible stand to show off Apple’s little wonder. The result was the Xtand™ – it won a bunch of awards and, more importantly, took pride of place on the desks of thousands of iPhone fans. Just Mobile has never looked back. These days, they produce a wide range of premium accessories – from innovative stands for laptops to stylish backup batteries for iPods. Stuff people love. Even their mousemat has won a reddot design award.